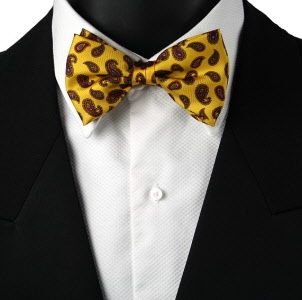 If you are trying to find bow ties for your tuxedo there has never been so much choice. Nowadays bow ties for men are available in a huge range of patterned and plain designs in both pre-tied and self tie styles. Whilst the plain, James Bond style black bow tie is still very much alive and kicking, there are now polka dots, tartans, striped bow ties plus of course velvets, traditional paisley and every pattern imaginable to enhance your wardrobe whether for evening wear or day wear. Choose from ready tied or, for the more adventurous, self tie bow ties. Our how to tie a bow tie link will show you how if you are a newcomer. Finally, for those who want fun, our novelty bows are great for breaking the ice at parties! Our collection includes both silks and man made fibres. We have plain bows for those official dinner parties where something loud is not appropriate and bright patterned flamboyant bows for when it is! Whatever you require, there is something here for you. See boys bow ties for children's neckwear. A range of plain bow ties in both colourful and traditional shades. Attractive striped bow ties in vertical and diagonal designs. Spots and polka dot bow ties in a fine array of spotty colours in pre-tied and self tie styles. Take a look at our pre-tied bow ties with many different patterns you will be spoilt for choice. If self tie bow ties are your preference, we have a wide range of patterns in quality English silk in both neat and flamboyant patterns. Sometimes, a classic bow is just not enough. Our novelty bow ties cover a wide range of subjects, so when you want a little fun take a look at our selection to find a subject that suits you. Scottish tartan bow ties in pre-tied styles made from pure new wool. Our paisley bow ties are always extremely popular. With bright coloured backgrounds and made from English silk, these impressive bow ties will always look good no matter what the occasion.